This was my dad's favorite saying! 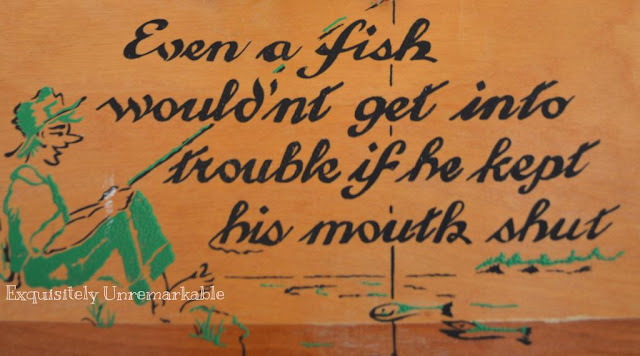 A small wooden sign used to hang in his workshop as a reminder to all of us~ I don't know who came up with these pithy old sayings, but they never seem to go out of style! 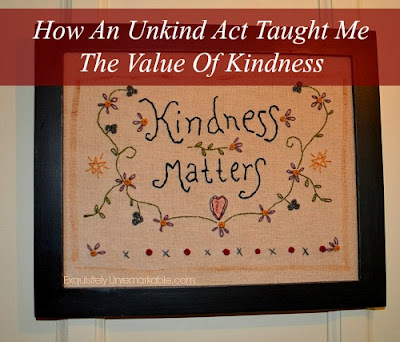 For years, these words rang in my head and I would picture that cute, crooked wooden plaque, whenever I was confronted with the opportunity to gossip. I had forgotten about it for a long while as the sign disappeared when my mom sold the house. Then one day, my husband and I were at a yard sale and I spotted this one and I grabbed it. I think it was a quarter. I am so glad that it is in my possession and that the words are in my brain, again. The sentiment is very true and the words are a neat reminder of my dad and his wisdom! Of course, coming from an old world family~ two parents who were first generation Americans and two sets of grandparents who were steeped in their respective cultures, lots of these sayings were always being thrown around, yet for some reason, this one always seemed to stick with me. Great advice for any time! Do you have any pithy sayings from childhood that are stuck on your head? I'd love to hear them~ please share! My grandma always would say "onward and upward" when something bad happened. I can't remember other specific sayings but love the oldies! My grandmother used to say, "This too shall pass" when something bad happened! Those grandmas~ such optimists! My grandmother used to say "I'll give you a nickel and you can ride up," when she caught my sister or me picking our nose. Not exactly words of wisdom, but it always made me laugh. And stop picking my nose. Now that is one that I have never heard before! What's even funnier is that a nickel is probably what a bus ride cost back in the day when the saying was "coined"~ sorry~ bad pun! My Dad used to say "You make a better door than a window" when we were blocking his view of the TV. and whenever something happened in our house that neither Nancy or I would own up to my parents would say "The ghost must have done it" The funny things we remember! I remember the "ghost" comment, Jen!! I love the door/ window comment...we still say that around here! :) I think it's funny that I say some of them to my kids now...I guess that means I'm old! My grandmother had great words of wisdom and cooky sayings...."If they don't come, they don't have to go home." (when someone didn't come to one of the family get togethers) and this one made you scratch your head till she explained it..."If they don't know me, they wouldn't recognize me" (when she went out of the house without make up and didn't really care if strangers saw her that way). I always used to tell my mom that if you need to explain the saying, then it isn't really that good! That rule seems to apply to these two, although I may use that second one on my teens when they give me a hard time about leaving the house in my baseball cap! "I think I will..." brought the comment "Good intentions pave the way to Hell". Yes, I have heard that one at relatives' houses, too! That's a new one! My dad keeps using the phrase 'a place for everything and everything in its place!' Used to drive me crazy but now I agree! I totally get it! My uncle used to say 'it takes longer to talk about it, than it does to do it' and we used to scoff...now I find myself saying it to my own kids! I love it! Somehow I have never before heard of this darling expression. It certainly is an oldie...but I think it still rings true! 'After a fashion', my mother said that frequently. Meaning sort of. Have heard of that one, Janet. My mom didn't say it, but I remember hearing it in the old movies! My Mother always said "It just isn't done" to almost any question about why we couldn't do one thing or another that seemed reasonable to children. My mom used to say that, too, Ellen! !